We bring a rebel exhibit to the National Portrait Gallery – BP or not BP? Posted on September 1, 2017 September 5, 2017 by BP or not BP? Last night at 7.30pm, a group of twelve performers – including respected street artist Dale Grimshaw – set up a new exhibit, without permission, inside the National Portrait Gallery in London. They took over a space at the entrance to the BP Portrait Award exhibition, and set up a display featuring an original portrait by Grimshaw. This portrait shows the Indigenous West Papuan independence leader, Benny Wenda . Dale Grimshaw talks to the public inside the gallery about his portrait of Benny Wenda. Photo by Kristian Buus. This quote was shown prominently beside the portrait in tonight’s rebel art display, and was also printed on hundreds of leaflets given to gallery visitors by the performers, who are from the theatrical action group BP or not BP?. 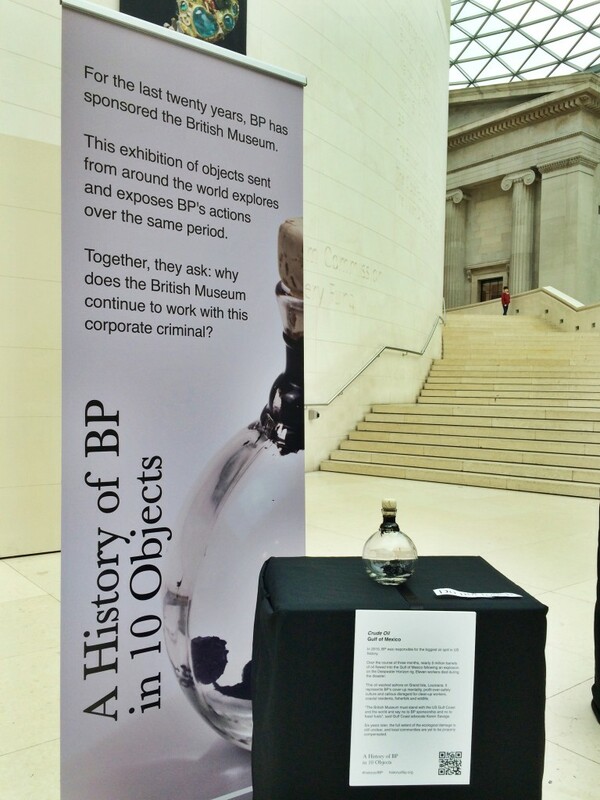 Gallery staff attempted to usher the public out of the BP exhibition, but in doing so brought large numbers of people through the room with the unsanctioned exhibit, where many stayed to listen to the talks and performances. Gallery visitors read leaflets about the rebel exhibit. Photo by Kristian Buus. Last night’s performance was timed to coincide with the hand-in, earlier in the day in Geneva, of a 200,000-strong international petition calling for a free and fair independence vote for the people of West Papua. This petition has been banned in Indonesia itself and West Papuan activist Yanto Awerkion is currently in jail, imprisoned by the Indonesian government for collecting petition signatures. Earlier this year, Dale Grimshaw entered the portrait of Benny Wenda into the BP Portrait Award as a way to raise awareness of the West Papuan cause, and to highlight BP’s support for the Indonesian regime. However, the portrait was not shortlisted by the judges. BP’s relationship with Indonesia – and with other repressive governments including Egypt, Azerbaijan and Mexico – are currently the subject of a formal complaint to the National Portrait Gallery by the campaign group Culture Unstained. Freedom of Information requests have revealed that the gallery’s Ethical Fundraising Policy expresses concerns about taking money from companies “known or suspected to be closely associated with a regime known or suspected to be in violation of human rights”. The gallery’s deal with BP appears to contravene this policy, and so Culture Unstained are pursuing the matter through a formal complaints process. Visitors watch a film by West Papuan activist Raki Ap about BP’s activities in West Papua. Photo by Kristian Buus. The group stayed in the gallery until it closed at 9pm, giving talks to the public about the painting and showing films of Benny Wenda and Raki Ap, another prominent West Papuan activist, talking about BP’s role in the occupation of their lands. The group also performed a spoof awards ceremony, where BP received a “Pollution Award”, the National Portrait Gallery was given a “Hypocrisy Award” for their failure to follow their own ethical funding policy, and the West Papuan activist Yanto Awerkion was presented in absentia with an award for courage, and had the whole performance dedicated to him. The National Portrait Gallery refuses to say how much money it gets from BP, but estimates place it at around £375,000 per year . This is less than 2% of the gallery’s annual income, and is less than the price of two 30-second TV adverts during the final of The X-Factor. By comparison, National Portrait Gallery visitors contribute around £3 million per year through ticket purchases alone, while taxpayers provide £6.6 million per year. Meanwhile, the UK government gives hundreds of millions of pounds of taxpayer money in subsidies to BP each year. BP’s new five-year deal with four cultural institutions (the British Museum, the National Portrait Gallery, the Royal Opera House and the Royal Shakespeare Company) costs £7.5 million over five years, according to the company itself. If divided equally between all four institutions, this comes to £375,000 per institution per year.